Choosing your wedding’s colour theme is an important step. Begin by thinking about what kind of mood you want to evoke at your wedding. 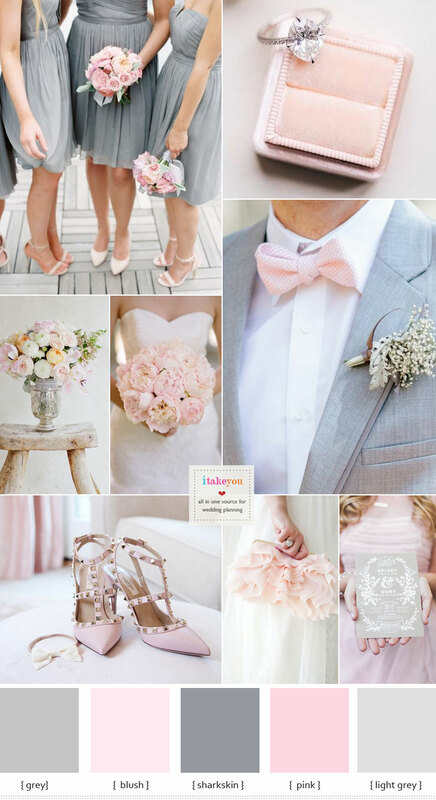 Today’s we have a pretty wedding palette that not too girly but feminine enough. I know many girls stay away from pink but the pink + grey combo makes it less girly and more refined. ” Grey and Pink Wedding Colour Schemes ” A grey and pink blush wedding colour theme is popular among many couples, because it is simple and sophisticated. These two coloyrs are timeless on its own and when combined together becomes ultra sleek and modern. Bridal Accessories : A bridal clutch is a necessary accessory for every bride to store just a couple of things she needs – a lip gloss, a compact and a mirror. You could get something sparkly clucth for a touch of glam. Or this blush pink! How gorgeous is this blush pink ruffled clutch? Bridesmaids : In keeping with the grey and pink wedding colur theme, the bride should stick with the traditional white wedding gown. The bridesmaids can contrast the bride by wearing grey dresses. Whether it’s short or long, the bridesmaids will love having this option. Not only does it make them look slimmer, it’s something universal that they can most likely wear again. Groom and Groomsmen : If you don well,wearing pink can be stylish and attractive. A lot of you guys still refuse to wear pink clothes. Great option is wear grey suit and have a pink bow tie. Flowers : There are many other little details that can be included into this theme. For instance the bridal bouquet, select an arrangement of blush flowers and use a grey ribbon to hold it all together. Wedding Guests : If you want the entire event to carry out your black and white theme, it’s important to get your guests involved too. You must make sure your wedding guests are well-informed that there is a dress code. Make the request prominent on your wedding invitations and have them confirm. Use invitations that are classically grey and pink to let them know exactly what kind of theme to expect.